Daughter of the famous composer Giacomo Meyerbeer. When she was sixteen years old she converted to Christianity. In 1866 she married the painter Gustav Richter, who was ninenteen years her senior. After her husband died in 1885 she lived at the Hohenzollernstrasse 12 at the Wannsee during the sommers and at Under den Linden 78 (near the Pariser Platz) in Berlin during the winters. Her salon was frequented by many musicians until the First World War and she and Cosima Liszt were friends. She was very wealthy and in 1913 she posessed three million gold marks. 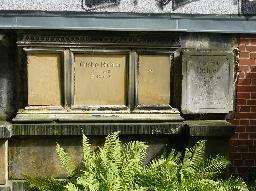 The grave of Gustav Richter at the Alter St. Matthäus Friedhof, Berlin.